Back in early 2017, OSHA announced new silica dust regulations and Bosch was the first company to proactively contact us to start the push toward education before the September 23rd deadline. That date has come and gone, but there’s still plenty of confusion running around about what you need and what you don’t. To help, there’s a Bosch Table 1 compliance website set up to help you ensure you’re OSHA-compliant for concrete work. There’s a lot of information to digest, but we’re breaking it down so you know exactly what you’ll find for the kind of work you’re doing. Just give the link in each section a click and it will take you right to Bosch’s page so you don’t have to search too hard. The dust solutions pages area all about choosing the right tools and accessories for the job. From the tool doing the work to the accessories it needs and attachments to dust extraction, Bosch has pre-approved packages to help you know you’re compliant before the job ever starts. This site breaks down the hammer drill, SDS-Plus rotary hammer, and SDS-Max rotary hammer choices with plenty of corded and cordless models available. As shown below, you’ll see an example in the first column followed by other models that will also work. The model numbers on Bosch’s page are linked so you can just click on them and go straight to the product page for more information. The columns to the right show the accessories and attachments you’ll need. For hammer drills, you’ll be turning to Bosch HDC200 dust shroud (below). Attach it to the end of your dust extractor hose, turn the vac on, and stick the shroud to the point where you’ll be drilling. From there, you just drill away and the shroud/vac combo takes care of the dust. Moving onto the rotary hammers and spline hammers, you’ll notice that Bosch recommends you go to their SpeedClean SDS-Plus and SDS-Max bits. You’re collecting the dust at the point of creation with those, greatly simplifying the process. If they don’t make the specific bit size you need or you want a different option, there are also dust shrouds. And if you happen to be using the Bosch GBH18V-26 cordless SDS-Plus rotary hammer, there’s an on-board dust extractor that you can add. Almost to the end, you’ll see Bosch’s dust extractor options. No matter which tool you’re using, the Bosch VAC090A or VAC140A along with the VF120H HEPA filter ensures that when you get to the last section on respiration, you don’t have to wear a mask. That’s a win. On the demolition side of Bosch Table 1 compliance, you’ll see that this page (and all five of the applications specific pages) follow the same format. For the demo tools, you have SDS-Max and spline hammer options along with Bosch demolition hammers and breakers. Attachments boil down to the HDC300 and HDC400 kits. These attach close to the point of contact to catch the dust that shoots out while bigger chunks fall away. Dust extraction options remain the same, but you’ll notice respiration is a requirement if you’re doing indoor demo or demoing for more than 4 hours on a shift. 4 hours of demo work per shift doesn’t mean that you’re tasked with demo work for 4 hours. It means that you’re doing 4 continuous hours of breaking in a shift. It doesn’t count the time that the tool isn’t actively working on demo. That’s a big factor when it comes to whether or not you’ll actually need the respirator. Bosch offers plenty of options in the surface grinding category. One way to go is with Bosch’s CSG15 5″ Concrete Surface Grinder. It has a dedicated dust collection shroud, so it technically doesn’t need any accessories. Just connect it to your dust extractor and check your respirator requirement. The rest of the grinders are broken into the 5″, 7″, and 9″ classes. Those are important distinctions because of dust extractor requirements. You need 25 CFM for every 1″ of grinder wheel. A 5″ grinder needs 125 CFM minimum, while a 9″ grinder needs 225 CFM. However, it’s about the wheel size, not max wheel size. If you use a 7″ wheel on a 9″ grinder, you only need 175 CFM. Dust shroud. Unless you’re using the CSG15, you’ll need a dust shroud to add to the grinder. You’ll notice that Bosch recommends using the same 7″ shroud for both their 7″ and 9″ grinders. That means you only need 175 CFM on your dust extractor since you’re working with a smaller wheel than the 9″ grinder can potentially accept. One other point – Bosch’s two dust extractors are both excellent, but only offer 150 CFM. That’s great for most portable dust extractors, but it you’re moving up to the 7″ or 9″ class, you’ll need to look elsewhere for your extractor. The respiration requirements are the same as with demo – if you’re working indoors or for more than 4 continuous hours, you’ll need to wear a respirator. Bosch Table 1 compliance concrete cutting solutions are very similar to the surface grinding category. There are fewer grinders to choose from, but still plenty there, and we see the introduction of the 6″ grinder class. The attachments change from horizontal to vertical shrouds to accommodate dry concrete cutting. We see that the 6″ grinder uses a 5″ shroud and the 9″ grinder sticks with a 7″ shroud like with surface grinding. Dust extraction options remain unchanged, including the requirement for additional dust extractor CFM on the 7″ and 9″ grinders. Again, respirators are only required for indoor work and 4+ hours of continuous use. Tuckpointing is the final application-specific category for Bosch Table 1 compliance. There are a couple of tuckpointer models to choose from that don’t require additional accessories. You also have 4-1/2″ to 6″ grinders you can add shrouds to. Dust extraction stays the same, with Bosch able to cover all of the grinder sizes in this category. What takes a drastic change here is respiration requirements. Whether you’re tuckpointing for 30 seconds or all day, you have to wear a respirator. Bosch has a number set up specifically for Table 1 compliance questions. If you’re not sure that you have everything you need or just have questions in general, give them a call at 1-800-416-9608. If you’re going to be drilling, chiseling, demoing, grinding, cutting, or tuckpointing in concrete, Bosch has their objective data compliance letters already prepared in a downloadable form for their accessory packages if you need it. Just find the one you need and click to download it for future reference or print it out. Have a crewmember who’s just not taking silica dust seriously? Or maybe you’re not so sure why it’s such a big deal? 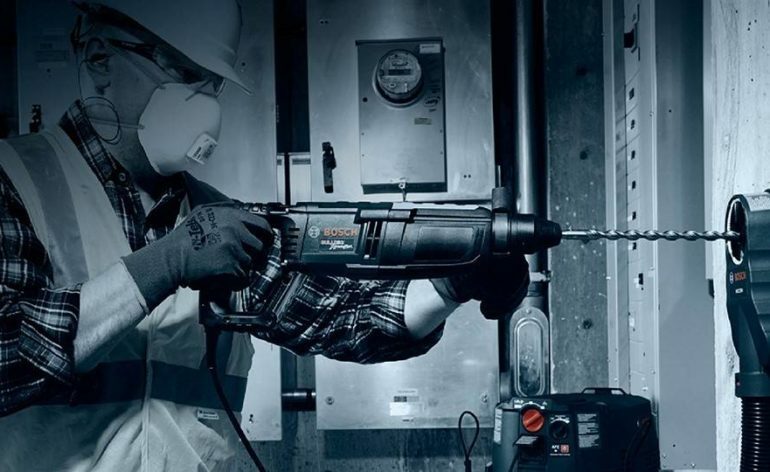 Bosch has an easy-to-read breakdown of the dangers of silica dust exposure. You can also find out more about OSHA silica dust regulations or kick over to 3M’s website to consider their respiration solutions. Finally, you can get a breakdown of essentially everything on the Bosch Table 1 compliance website in a downloadable PDF. It’s useful to have on hand when you have unpredictable or no web access. Or maybe you’re like me and digesting all that information is easier for you with a printed copy than scrolling through web pages. Either way, it’s a great resource have on hand. Scrolling just beneath that, you’ll find links to other helpful resources from OSHA and SilicaSafe.org. —ProToolReviews.com publishes hundreds of tool reviews, product previews, and tool-related articles each year. Its annual Pro Tool Innovation Awards recognize the year’s most innovative tools, accessories, and fasteners.